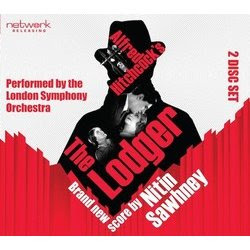 To coincide with the recent restoration and theatrical release of early Alfred Hitchcock thriller 'The Lodger', Network Releasing are releasing the film's newly created soundtrack - written by Nitin Sawhney and performed by the London Symphony Orchestra. We have a copy to give away, find out how to win below. 'The Lodger' was made in 1926, starring Ivor Novello as a mysterious lodger suspected of being the serial killer known as the Avenger. The fact that Nitin Sawnhey has been handed the reins over the soundtrack is apt considering his own involvement in the current Ivor Novello awards. Hitchcock's film was heavily influenced by the German expressionist movement and films such as 'Nosferatu' and 'The Cabinet of Doctor Caligari' - the latter of which is currently having its own live soundtrack performance delivered by Martyn Jacques at the Soho Theatre. HOW TO WIN: Simply email your answer to the following question to fgcompetition-hitchcock@yahoo.co.uk, with The Lodger as the subject/title of the email. Which famous Hollywood director was responsible for 'The Lodger'? 'The Lodger' soundtrack was released on 23 July '12, and is available to purchase at amazon.co.uk.